From the mighty town Seattle there is much more to the music scene than crack smoking grunge bands with stupid hair cuts. 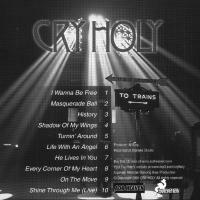 On the positiv side there is a band called Cry Holy which is a band with a Christian background and with several exellent albums already made. The band is as yet unsigned but hopefully they get their well deserved record deal before to long. 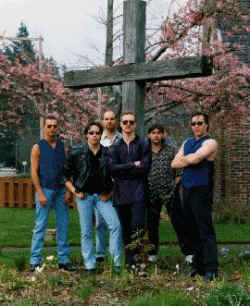 Their overall positive attitude and a musical style and abilities matching their heroes like Journey and Styx has already impressed me - so read on and learn all about Cry Holy on the backside of the cover it says: "Our Prayer is that after hearing this album, not only will Cry Holy have garnered another fan, but that the kingdom may receive another soul". A: James Henry and Mike Maxwell started working together about ten years ago under the name SAHARA RAIN, only in a recording capactiy. We wanted to branch out and play live, but Jim had a problem playing and singing at the same time. Randy Loran from New York heard a demo, and moved out to Seattle to be part of the outfit. Randy knew Erik Routson, bass player who lived in Seattle, and also brought his brother Scott to Seattle from Illinois, to play rythm guitar. 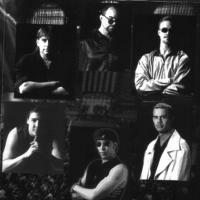 Erik brought Gary Reems, keyboard player into the fold, and Cry Holy was born. Q: You are a proclamed Christian band, how does that influence your approach to the music-scene - and on your expression in general? A: It's been a little tough. You can't just play anywhere when you are a "Christian" band, it kind of limits you to churches and such, although you'd be suprised at some places that we've played. A three day festival at Darrington Ampitheatre near Seattle, and Mural Ampitheatre, right underneath the Seattle Space Needle. We try not to come across too heavy with the gospel message, just so we don't isolate our audience, but at the same time, we don't want to compromise it either. I think we cater to Christians and non-Christians alike. We are really no different than our non-Christian AOR counterparts out there, we just try to get a positive message across, which is the good news of Jesus Christ, but in a way that can be recieved by everyone. Q: In Denmark (and Europe) we don't have a category called Christian Contemporary Music - can you explain the phenomenon to me? A: In America, the lines are kind of drawn between Christian music and secular, unless you are someone like Amy Grant. But more rock and roll Christian bands like Petra, Whiteheart, and Steven Curtis Chapman are definately considered "Christian" music, and their albums are only found in Christian book stores and the like. The big record labels do that. I really like Europes's approach where you can say "Praise God" or the opposite end of the spectrum "Hail Satan" (extreme examples of course), but if it's good rock and roll, it gets attention, airplay, and reviews written about the album. America doesn't give small bands like us a chance unless you are the flavor of the month boy band like N'SYNC or have sold 10,000 units of your album. America could learn a lesson from Europe. A seperate catagory for Christian music isn't really an advantage at all, it kind of isolates you and exposes you only to a "Christian" audience, which kind of defeats the purpose for us! Q: Can you describe your "evolution" as a band from your first CD until these present days? A: I'm glad you asked that, no one's asked it before. I think we evolved from the early days from a band that had many influences musically to taking those influences and also putting our own sound in the music. In other words, not just sounding a little like Journey, but sounding like Journey and doing the song the way Cry Holy would do it. I think we have a distinct sound, or at least I hope we try to communicate that. After that, we definately evolved from the studio to a live outfit. We really lived to play live. But of course when you are an independent band, putting on your own shows, playing live can be draining, especially when you're tying to hold down day jobs as well. But we would pull off hour and a half shows of original material and the audience would be into it! And of course now, the evolution is with the internet , and that has opened a whole new world to us(literally!) I knew the internet thing was really evolving when my wife and I took a trip to Vancouver, Canada, and I walked into Virgin Records. I walked up to the magazine rack which has magazines from all over the world. I opened up a British magazine, Powerplay I believe, and there was a review of the album in it. They did not contact me like most magazines and webzines usually do. They just picked up the album from Aorheaven and gave it a review (fortunately, a favorable one! ), and I stumbled across it. We are now trying to raise the money to record our next album which we know will put "Ten From Two" to shame (we hope anyway). It is called "Alienation" a concept album set in the future, kind of a cross between H.G. Well's "War of the Worlds" meets the "Left Behind" books, books about biblical events yet to happen. This time around we have Erik Zimmerman who mastered the Jason Becker tribute album mastering for us at a discounted price, because he knows we don't have lot of money to work with. So I know already it will sound better, and I think the songs are far superior. Q: What are your main influences - i can hear some tones from LeRoux and White Heart - is that right? A: Whiteheart definately, I love that band! Petra as well, Journey, Styx, Bon Jovi and Starship to name a few. One interviewer, Juha Harjula from Midwestern Skies in Sweden actually gave us quite a compliment in a review that was not even a review of Cry Holy. 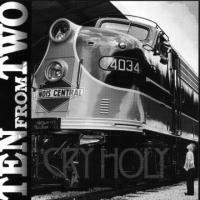 He ended our review with "So if you are into bands like Journey, Survivor, and Savannah, Cry Holy is a band for you". In another band's review, Vision 180 I believe, he ended their review with "So if you are into bands like Cry Holy..." That was cool, because he was citing us as an influence for fans of that band. That was flattering to read. Q: You have had some good reviews on several on-line magazines - are there a interest from some companies as well? And how do you see your future? A: A good question as well. We sent Z Records and Now and Then our demo, but they passed. We've had almost all favorable reviews and for that I am grateful! But we have been knocked down a bit for production quality by the labels, which is not quite fair. While the production is not superior, I think the production is good for what it is, and what some of the labels have to realize is that we are still essentially an independent band. We don't have the big bucks for a highly produced album. They need to look at the songs and the songwriting ability, and our potential, not the final product that we have produced on our limited budget. Aorheaven will release the next album, and we are grateful to Georg Siegl for the start he's given us. It has given us some good exposure, but he doesn't fund the recording costs. We would like to get with a label that funds the recordings. That is the toughest amount of money to come up with, recording costs. I see us with a label that will provide that, and hopefully a chance to do the music live again. We would also like to try to release a DVD of one of our shows, but that would be a litle ways in the future, we'd have to get a bit more established for that. Steen Peitersen: I hope that you will get your well deserved deal to get a worldwide distribution and will have the opportunity to record a high-budget album - so Mr. A&R man contact this band!! ?